This page covers the timecode representation in Motive and how it can be accessed through the NatNet SDK library tools. 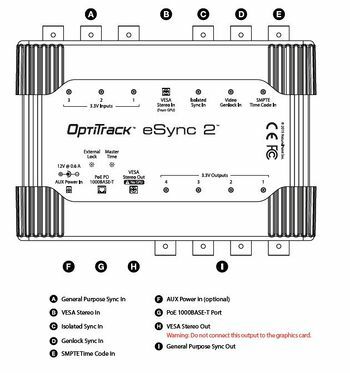 SMPTE Timecode signals can be integrated into OptiTrack motion capture systems through the eSync synchronization hub. To do this, simply connect a timecode sync source to the SMPTE Timecode Input of the eSync. 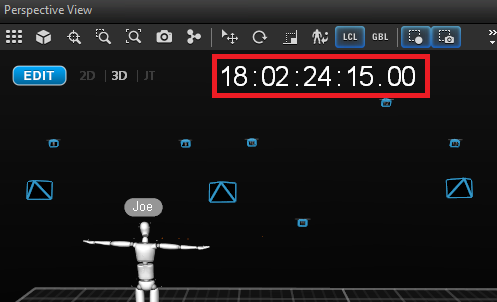 Once the signal is detected, the corresponding timecode will be displayed at the top-right corner of the Perspective View pane in Motive. When you capture a Take with timecode signal, the information saved into the corresponding Take file. Note: SMPTE Timecode integration requires the eSync hub. The eSync 2 synchronization hub. SMPTE Timecode signal connects to the input port E.
In the above sample representation, a 120 FPS motion capture session is synchronized to a sync source with 30 FPS no-drop SMPTE timecode signal. In this case, there is a 4 : 1 ratio of number motion capture frames to a single frame of the sync source, and the extra motion capture frames are represented by the OptiTrack SubFrame field in the OptiTrack timecode. Live mode: When streaming in real-time, the Timecode parameter is available only when SMPTE timecode signal is present in your mocap hardware setup; typically when using the eSync and a timecode generator. When present, the Timecode parameter will be a correctly formatted SMPTE timecode value. Edit Mode: When streaming from a recorded playback, the Timecode parameter is the current frame number converted to SMPTE Timecode format. Timecode values should not be used directly, but decoded using the provided NatNet tools. Within the NatNetClient class, there are methods for decoding the Timecode parameter and the TimecodeSubframe parameter (DecodeTimecode) and converting them into a string-friendly format (TimecodeStringify). The NatNet SDK provides utility functions for decoding the Timecode parameter and the TimecodeSubframe parameter (NatNet_DecodeTimecode) and converting them into a string-friendly format (NatNet_TimecodeStringify).